The abolitionist movement, Bordewich (My Mother’s Ghost, 2000, etc.) notes, began not long after the Revolutionary War ended, and it began in the revolutionary hotbed of Philadelphia. 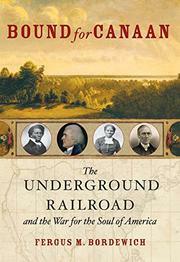 Its earliest members were religious activists, though as the 19th century progressed, the Underground Railroad—the term refers to an interlocking system of routes and way stations by which slaves were afforded escape—became hydra-headed, with very little central direction, a great deal of individual initiative, and no set ideology save for one overarching goal: “to provide aid to any fugitive slave who asked for it.” In those early days, Bordewich writes, utmost secrecy was of the essence, for slavery was allowed and practiced everywhere in the US but Vermont; gradually, however, the North shed the “peculiar institution,” while Thomas Jefferson hazarded that the South would soon follow. Thus turn-of-the-century law required that fugitive slaves be returned to their owners, one reason that the Underground Railroad’s favored terminus was enlightened Canada, where fugitives found work as skilled construction workers, “as shoemakers, tailors, barbers, cooks, and agricultural laborers,” and even as some of the first tourist guides at Niagara Falls. Things became more complicated when slave states and free states butted heads: for instance, when free blacks in Cincinnati surrounded slaves on the way to Kentucky and urged them not to go any farther, and when a Philadelphia court ruled that the slave of a South Carolina senator resident in the city was a free man, having lived in Pennsylvania long enough to establish legal residency. It might have shocked some of the pacifist founders of the Underground Railroad, Bordewich ventures, to learn that their actions would in time help spark the Civil War—and perhaps even to know that abolitionism would directly beget feminism. Rich in detail and solid storytelling: sure to awaken interest in the peculiar anti-institution.